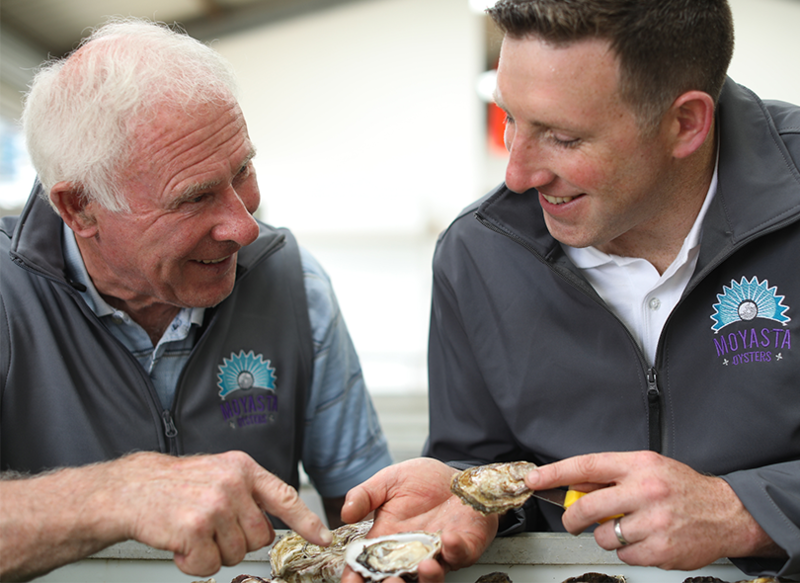 Moyasta Oysters is a traditional family business established in 1997 by Michael Galvin. After running it for over 20 years, Michael passed the reins to son Thomas Galvin. The family business has flourished and gone from strength to strength – with Thomas at the helm and his wife Hannah alongside. Thomas’ brother Bernard is Farm Manager, while Michael still plays an active role. We’re proud that the company remains the same tight-knit family unit that it has always been – expressed in the personal care we give every customer. We are located in the Grade A certified waters of County Clare’s Poulnasherry Bay – named after the Irish word for ‘hole of the oyster’. These sheltered waters form part of the Shannon Estuary, where the river Shannon, Irelands longest river, meets the Atlantic Ocean. The entire Estuary is designated as a Special Area of Conservation (SAC) – an important Irish and European wildlife conservation area. 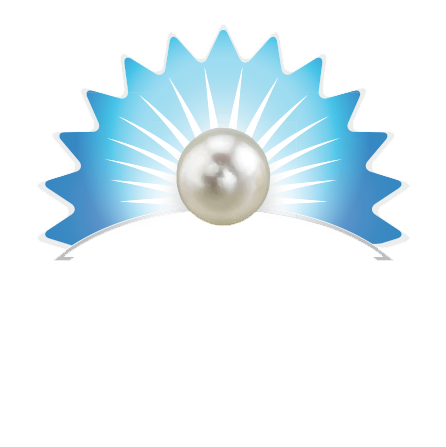 Today, our company produces between 80 and 100 tonnes of Grade A oysters every year. We take unmatched care of our oysters throughout each stage of the oyster’s growth cycle, cultivation and harvesting. 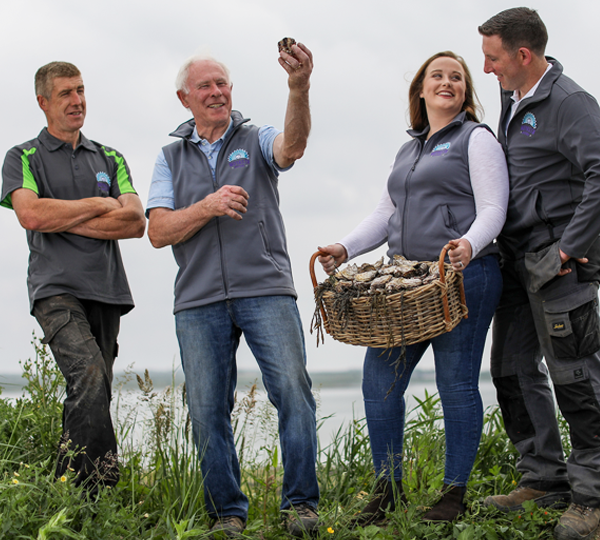 From seedlings to maturity, we tend every Moyasta Oyster for three years – turning, shaking and cleaning them as they grow. This helps them form perfectly: they develop good meat content and a sturdy, beautiful, manicured shell that will endure any overseas flight. After harvesting, our oysters are washed and packed by hand in our factory and sent to each customer within hours – locking in their unique flavour every time. We also take the extra step of sending our oysters for monthly quality testing. We have a fully-equipped, specialist factory just yards away from the bay where we collect our oysters. We have invested heavily in the best grading machinery to size-sort our oysters, and we also have a sophisticated depuration unit where the oysters are depurated for 48 hours before export. (While this is not necessary for Grade A oysters, we have added this extra level of quality control). While we still use many traditional farming methods, Thomas – with his engineering background – constantly looks ahead to see how we can progress and improve the way we grow our oysters. We use state-of-the-art SEAPA Tide-Turning equipment to turn the oysters – taking advantage of the tide and current motion of the bay, while Thomas has also developed his own unique bag and float system. We are proud to have received the Aquaculture Innovation Award at the BIM National Seafood Awards 2018 – in recognition of our breakthrough oyster-growing technology. Though we’ve grown, we are proud of the strong, close and loyal relationships we have with our customers, which we nurture through excellent service and personal care. Oysters are sensitive souls, they need regular nurturing. We work with the tides which requires time and patience both day and night.